Is there anything better than 85° weather in March? The sun came out this week and had us lounging outside most waking hours. Davis’ Picnic in the Park, which kicked off two weeks ago, finally had proper weather, and we were so busy enjoying the warmth that I almost forgot to find this week’s food. 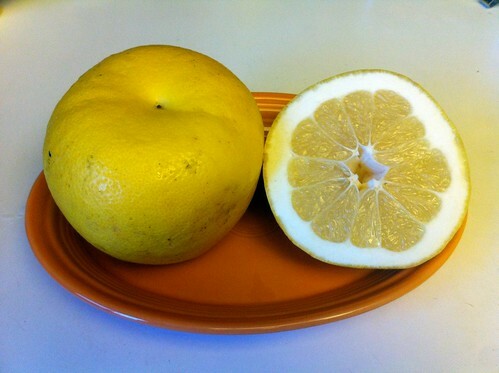 Fortunately, with minutes to spare, I came across a stack of grapefruits that looked promising. I really have never understood eating grapefruit. In my mind, citrus should be sweet, and covering fruit in sugar to make it so seems like an indulgence ill-suited for breakfast. 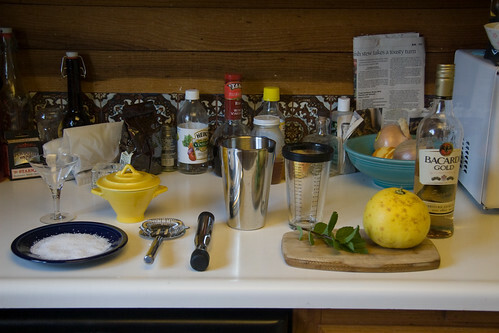 All the same, I’ve come to realize that the properties I dislike in grapefruit as a food—bitterness and astringency—make it a complex and rewarding ingredient in cocktails. When the sun comes out, I long for nothing more than a swimming pool and a refreshing drink. I am happy to lie poolside for hours on end, with an occasional dip to cool off. While Davis has an abundance of pools, few to which we have access have opened yet. I wanted to come up with a cocktail that reminded me of the poolside experience. To capture a sunny day at the pool, I reached for ingredients that each evoke a sensory experience from a day spent swimming and sunning. Grapefruit provides the astringent dryness of chlorine on the skin. Meanwhile, mint conjures the bracing feeling of jumping into cool water. 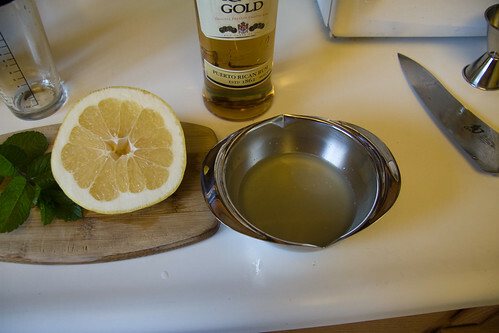 Using slightly sweet, gold rum as a base, I mixed 2 parts rum with 1 part freshly squeezed grapefruit juice. 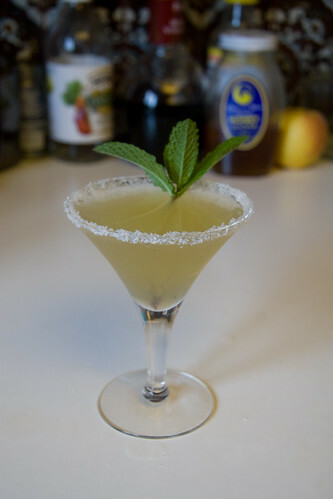 Then, in a cocktail shaker, I muddled mint leaves with a bit of sugar and a few dashes peach bitters. I shook all the ingredients with plenty of ice to get it nice and cold. When it came time to strain the cocktail, I poured it into a salt-rimmed glass; a reminder of the most ubiquitous flavor of a hot day at the pool: a line of sweat on the upper lip. The finished cocktail was light and refreshing, with a great balance between salty, bitter and sweet, a pleasing companion to a hot day. Unprompted, my wife said it tasted almost chlorinated, in a good way. Mission accomplished. Dip edge of cocktail glass in grapefruit juice then salt to completely cover rim. 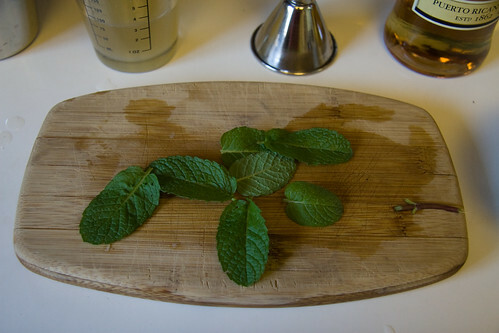 Muddle mint leaves, sugar and peach bitters in cocktail shaker until sugar is dissolved. 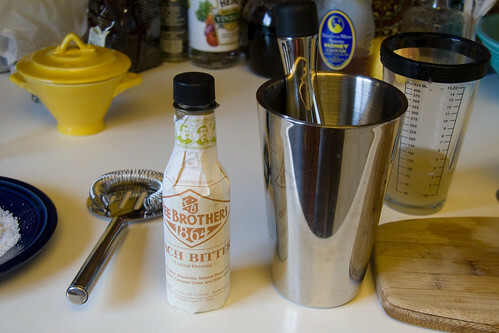 Add rum and grapefruit juice and shake vigorously over ice. 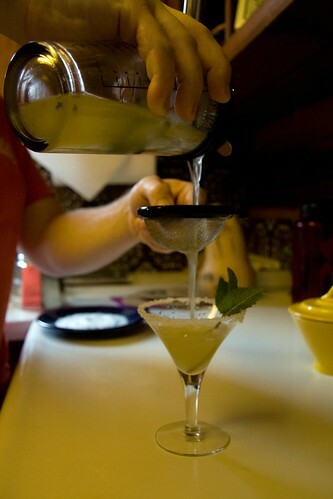 Pour through a fine mesh strainer into salt-rimmed glass, stopping just below salt line. Garnish with a sprig of mint. Take a look at all the photos here.